For latest news, see our blog. Home automation and control for iPad, iPhone, iPod touch and Android devices. Create reliable and cost-effective smart homes with CommandFusion hardware. Scalable for large or small systems using the CFLink bus. See how CommandFusion products are used in residential and commercial automation. Find out where you can buy CommandFusion products. Online ordering available, shipping anywhere in the world. CommandFusion creates automation hardware + software, providing a powerful end to end automation and control solution. The residential application diagram shows a typical home control solution using CommandFusion hardware and software products. CommandFusion products are also widely used in the commercial, educational and places of worship markets. 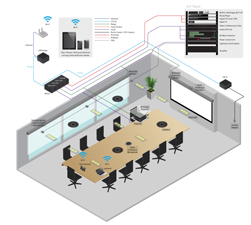 The boardroom application diagram shows a typical commercial control solution using CommandFusion hardware and software products. 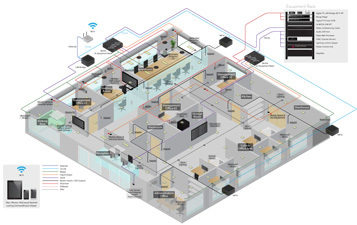 The office building application diagram shows a larger scale commercial control solution using CommandFusion hardware and software products.